Impressively directed, superbly designed and eye-poppingly colourful, this is an enjoyable action-adventure flick, providing you like things that go vroom. 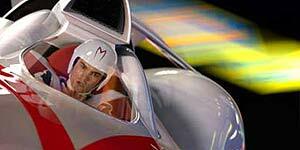 Based on the popular 1960s anime-style cartoon (although not as well known here as in the US), Speed Racer stars Emile Hirsch as racing fanatic Speed Racer, whose older brother Rex (Scott Porter) died in a mysterious racing accident ten years previously. With the support of his loving family – Mom (Susan Sarandon), Pops (John Goodman), little brother Spritle (Paulie Litt) and mechanic Sparky (Kick Gurry) – as well as loyal girlfriend Trixie (Christina Ricci), Speed is now the rising star on the racing circuit, which brings him to the attention of sinister corporate sponsor Mr Royalton (Roger Allam). When Speed refuses to join Royalton's team, he finds himself targeted on the track by Royalton's racers. However, help is at hand in the form of the mysterious masked driver, Racer X (Matthew Fox), who persuades Speed to help him expose corruption in the sport. Directed by the Wachowski Brothers, Speed Racer uses an impressive blend of live action and state-of-the-art animation to brilliantly recreate the whizzy animation style of the cartoons. The set designs are incredibly detailed (see the digital projection version if you can) and so brightly coloured that you could be forgiven for thinking you were hallucinating. The performances are excellent, particularly Emile Hirsch, John Goodman and Susan Sarandon, while Roger Allam makes a suitably sinister villain (British, of course) and there's strong comic support from Paulie Litt and his scene-stealing chimpanzee as Speed's pesky little brother. In addition, the race sequences are excitingly shot using a style the Wachowskis have dubbed car fu, meaning that the cars do a lot of jumping, flipping and spinning around. The plot may be a fairly simplistic good-vs-evil affair but the family drama adds an interesting layer, particularly during the impressively edited, multiple flashback opening sequence. In short, Speed Racer is an entertaining, superbly directed blockbuster that's unlike anything you've seen before. Highly recommended.